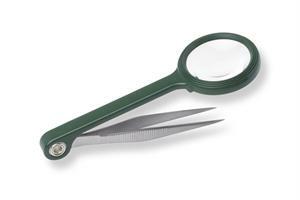 Carson OD-55 MagniGrip Magnifier is a compact magnifier with attached fine-point tweezer. Perfect for "little" jobs when you need an extra hand. The MagniGrip Magnifier is ideal to aid in tying flies. 4.5X Magnification. Dimensions 4" x 1.375" x .4375"